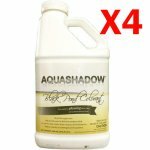 AquaShadow© Black Pond Dye - Liquid 4 Gal. Case Covers 8 Acres at 4 feet average depth. This product is a water soluble dye designed for use in lakes, ponds, decorative water features and other impounded bodies of water with limited outflow. This product beautifies murky, cloudy or off-colored water with a pleasing, reflective dark tint. AquaShadow© Black Pond Dye - Liquid 4 Gal. Case cover 8 acres at 4 feet average depth.